In what's likely the largest displacement of people in modern South American history, about seven per cent of Venezuela's peak population of 32.8 million had left by June, some 2.3 million in all, according to the UN. Venezuela's population outflow to the rest of the world more than doubled between 2015 and 2017. Venezuelans have fled in search of better lives in Brazil, Colombia, Peru and Ecuador. Colombia has been the most ostensibly welcoming of the South American countries, with hundreds of thousands crossing the border just within the past two years. It is a reversal of the flow of migrants that occurred when Colombia was wracked by sectarian violence for years and Venezuela was prospering due to a healthy international oil market. There is no formal shelter system in place in Colombia, however, so thousands of Venezuelans not able to legally work are selling their wares in public spaces or offering their services for work door to door. The Crespos from Valencia, Venezuela, are one such family. CBC News recently witnessed the family flagging down motorists beside a busy roadway in Colombia near the border trying to find buyers for their handicrafts to make a bit of money. Armed with stacks of old bolivar banknotes, the essentially worthless currency was being sewn and reshaped to make wallets and purses. The asking price was 10,000 pesos, or about $ 3 Cdn. 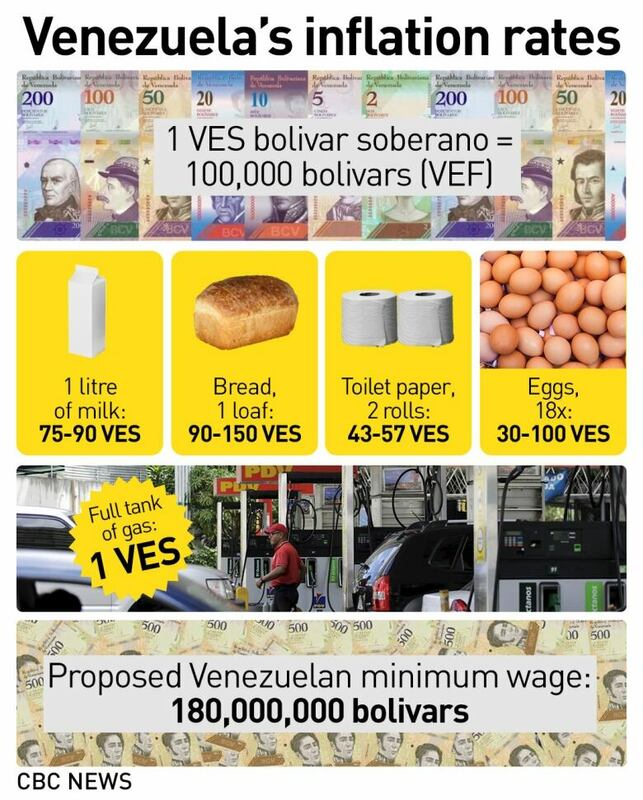 Approximately 100 bolivars would have fed the family for a month about five years ago. It may be a creative measure in a desperate situation, but it has appalled the UN ambassador from the United States, the most ardent critic of the Venezuelan regime. "Something is very wrong when citizens of an oil-rich country have to leave in order to beg on Colombian streets to feed their children," Nikki Haley said at an informal meeting of the UN Security Council on Monday. "That something is the corruption of the Maduro regime." Echoing unsuccessful monetary policy interventions in Zimbabwe, President Nicholas Maduro in late August heralded the new soberano bolivar and a host of accompanying measures intended to put the brakes on hyperinflation and help an economy experts say is heading for its third straight year of double-digit contraction. Economists at the International Monetary Fund had predicted the previous month the inflation rate by the end of the year could top one million per cent without intervention. With soaring prices for staple items due to shortages, earlier this year some companies were offering bonuses in eggs not cash to hungry Venezuelans. The new sovereign bolivar (VES) is a currency devalued by a factor of 100,000 compared to the old, and pegged to the petro, a new, elusive cryptocurrency measurement tied to oil reserves. 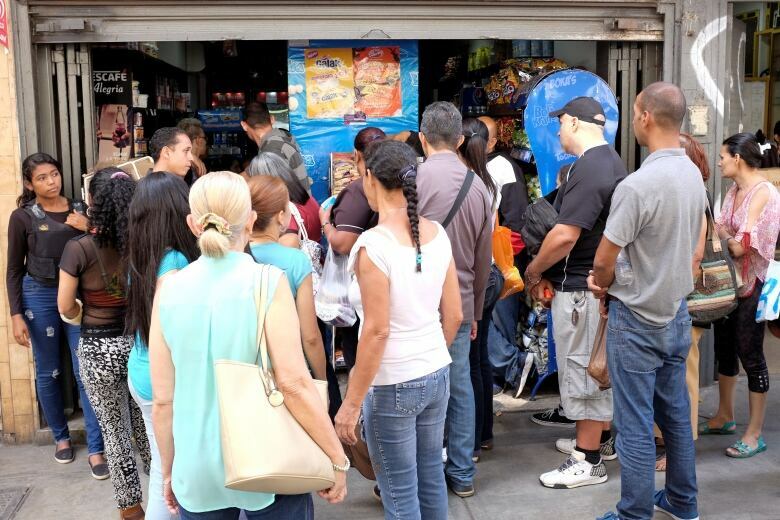 So while the sleight-of-hand means there aren't the eye-popping figures of recent weeks that equate to a month or more of salary for the average Venezuelan — 7.5 million bolivars (VEF) for a kilogram of chicken, for example — there is not yet any price relief, and additional layers of confusion have been added to an already fraught situation for people trying to get by. People flocked to stores ahead of Maduro's announcement — some hoping to stock up, and others to profit by reselling items on the black market. Since the change, daily limits on ATM withdrawals have been set at 10 new bolivars. At that rate, it would take five days of withdrawals to buy a half-carton of 18 eggs. Prices in regions near the borders of South American neighbours are higher than in Caracas. Items are cheaper when paid in cash rather than by debit card, but some markets may not accept cash at all. Maduro has introduced a minimum wage increase of 3,500 per cent effective Sept. 1 to help Venezuelans cope with the prices. Most employers can't afford such an abrupt increase, so the government has introduced a so-called Homeland card, where deposits can be made to an account tied to an individual's bank account. In addition to added confusion, in a country where the press has been muzzled and the assembly and judiciary stacked with Maduro loyalists, it gives the government a level of oversight that makes many people uneasy. Another significant measure from a government looking to replenish its own coffers is the first significant rise in gas prices in 20 years, to be rolled out beginning this month. It's a necessary move in the sense that, according to experts quoted by Reuters, Venezuela has been losing up to $ 5 billion US from fuel sales every year because it subsidizes gas well below international market rate. But it may bring a new kind of pain in the short term for many Venezuelans. One Venezuelan told CBC News this week he got up at 4 a.m. to fuel up. The line to the pumps can be measured in kilometres and take hours to complete. "[I'm] quite pissed," he said. "The Venezuelan government got us used to this." But in the end, he is still filling the tank. If Maduro's planned changes are introduced haphazardly, as too often has been the case in recent years in Venezuela, it may be too prohibitive for him to drive at all.